This really is among the fundamental techniques of investing in Options since it requires stepping into one particular placement of buying a Call Option Contract only. 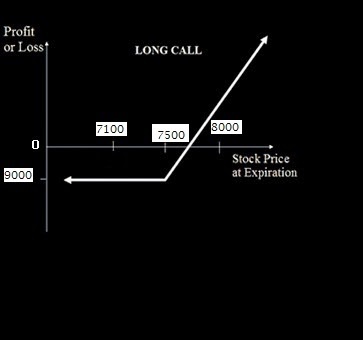 Any trader who purchases the Call Option is positive on the market and bet on the market to be going upside in the short term. Risk of the Buyer: The maximum risk of the buyer is the amount paid by her/him to buy the Call Option. This amount paid is called as the premium on Call Option. Reward for the Buyer: The reward will be unlimited as the underlying asset value can rise up to any value until the expiry of the Option Contract. However this unlimited word has literary value. As of now NIFTY is trading around 7800 levels, and the investor "A" is bullish on NIFTY. So he/she buys one 7700 Call Option [In-The-Money] for Rs.180 premium. Lot size of 1 NIFTY Option Contract is 50. Outcome 1: NIFTY closes at 8000 levels at the end of expiry of the contract therefore investor "A" will make a profit of Rs. 6000. Outcome 2: NIFTY dips to 7600 levels; "A" will have to bear a loss of Rs. 9000 (180*50) which is the premium he/she paid for buying one lot of 7700 Call Option. Below Is the Pay-Off Chart for the Option Contract bought.